On 15 March, an explosion was heard in Unit 2 and damaged the pressure-suppression system, causing the leaks of radioactive cooling water. Shortly afterward, Unit 4 was damaged by an explosion and a large amount of radioactive materials was released into the atmosphere. At 11:00 (Japan Standard Time) JST on 15 March, Unit 3 explored again. At that time, due to the easterly winds and precipitation in and around Fukushima, the surrounding areas including Tokyo, Nagano, Sendai and other places detected high radiation, which matched well with the simulation results. In 2011, RSMC Beijing for EER ［Environmental Emergency Response] is the chief RSMC in RAII [Asia], which is in charge of organizing the emergency response activities among RSMC Beijing, RSMC Tokyo and RSMC Obninsk and composition of the joint statements of RAII. SEATTLE — Scientists in Alaska are investigating whether local seals are being sickened by radiation from Japan's crippled Fukushima nuclear plant. Scores of ring seals have washed up on Alaska's Arctic coastline since July, suffering or killed by a mysterious disease marked by bleeding lesions on the hind flippers, irritated skin around the nose and eyes and patchy hair loss on the animals' fur coats. Biologists at first thought the seals were suffering from a virus, but they have so far been unable to identify one, and tests are now underway to find out if radiation is a factor. "We recently received samples of seal tissue from diseased animals captured near St. Lawrence Island with a request to examine the material for radioactivity," said John Kelley, Professor Emeritus at the Institute of Marine Science at the University of Alaska Fairbanks. "There is concern expressed by some members of the local communities that there may be some relationship to the Fukushima nuclear reactor's damage," he said. The results of the tests would not be available for "several weeks," Kelley said. Water tests have not picked up any evidence of elevated radiation in U.S. Pacific waters since the March earthquake and tsunami in Japan, which caused multiple fuel meltdowns at the Fukushima plant and forced tens of thousands of people to evacuate the surrounding area. Scientists from the National Oceanic and Atmospheric Administration and the U.S. Fish and Wildlife Service have been seeking the cause of the diseased seals for weeks, but have so far found no answers. A “culture of coverup” and inadequate cleanup efforts have combined to leave Japanese people exposed to “unconscionable” health risks nine months after last year’s meltdown of nuclear reactors at the Fukushima Dai-ichi power plant, health experts say. But temperatures inside the Fukushima power station's three melted cores have achieved a “cold shutdown condition,” while the release of radioactive materials is “under control,” according to the International Atomic Energy Agency (www.iaea.org/newscenter/news/2011/coldshutdown.html). That means government may soon allow some of the more than 100 000 evacuees from the area around the plant to return to their homes. They were evacuated from the region after it was struck with an 8.9 magnitude earthquake and a tsunami last March 11. Following the 1986 nuclear disaster at the Chernobyl nuclear power plant in the Ukraine, “clear targets were set so that anybody anticipated to receive more than five millisieverts in a year were evacuated, no question,” Ruff explains. In areas with levels between one and five millisieverts, measures were taken to mitigate the risk of ingesting radioactive materials, including bans on local food consumption, and residents were offered the option of relocating. Exposures below one millisievert were still considered worth monitoring. Were Japan to impose similar strictures, officials would have to evacuate some 1800 square kilometres and impose restrictions on food produced in another 11 100 square kilometres, according to estimates of the contamination presented by Dr. Kozo Tatara for the Japan Public Health Association at the American Public Health Association's 139th annual meeting and exposition in November in Washington, District of Columbia. “It’s very difficult to persuade people that the level [of exposure set by the government] is okay,” Tatara told delegates to the meeting. He declined requests for an interview. “In some places, you can see mounds of contaminated soil that have just been aggregated under blue tarps,” he adds. The Japanese government did not respond to inquiries. WASHINGTON, Dec. 19, 2011 /PRNewswire via COMTEX/ -- Impact Seen As Roughly Comparable to Radiation-Related Deaths After Chernobyl; Infants Are Hardest Hit, With Continuing Research Showing Even Higher Possible Death Count. Authors Joseph Mangano and Janette Sherman note that their estimate of 14,000 excess U.S. deaths in the 14 weeks after the Fukushima meltdowns is comparable to the 16,500 excess deaths in the 17 weeks after the Chernobyl meltdown in 1986. The rise in reported deaths after Fukushima was largest among U.S. infants under age one. The 2010-2011 increase for infant deaths in the spring was 1.8 percent, compared to a decrease of 8.37 percent in the preceding 14 weeks. The IJHS article will be published Tuesday and will be available online as of 11 a.m. EST at http://www.radiation.org . Epidemiologist Joseph Mangano, MPH MBA, said: "This study of Fukushima health hazards is the first to be published in a scientific journal. It raises concerns, and strongly suggests that health studies continue, to understand the true impact of Fukushima in Japan and around the world. Findings are important to the current debate of whether to build new reactors, and how long to keep aging ones in operation." Mangano is executive director, Radiation and Public Health Project, and the author of 27 peer-reviewed medical journal articles and letters. Internist and toxicologist Janette Sherman, MD, said: "Based on our continuing research, the actual death count here may be as high as 18,000, with influenza and pneumonia, which were up five-fold in the period in question as a cause of death. Deaths are seen across all ages, but we continue to find that infants are hardest hit because their tissues are rapidly multiplying, they have undeveloped immune systems, and the doses of radioisotopes are proportionally greater than for adults. "Dr. Sherman is an adjunct professor, Western Michigan University, and contributing editor of "Chernobyl - Consequences of the Catastrophe for People and the Environment" published by the NY Academy of Sciences in 2009, and author of "Chemical Exposure and Disease and Life's Delicate Balance - Causes and Prevention of Breast Cancer." The Centers for Disease Control and Prevention (CDC) issues weekly reports on numbers of deaths for 122 U.S. cities with a population over 100,000, or about 25-30 percent of the U.S. In the 14 weeks after Fukushima fallout arrived in the U.S. (March 20 to June 25), deaths reported to the CDC rose 4.46 percent from the same period in 2010, compared to just 2.34 percent in the 14 weeks prior. Estimated excess deaths during this period for the entire U.S. are about 14,000. Hubris, also hybris, means extreme haughtiness, pride or arrogance. Hubris often indicates a loss of contact with reality and an overestimation of one's own competence or capabilities, especially when the person exhibiting it is in a position of power. Cold War weapons production in the U.S. left the country with “a significant nuclear cleanup legacy, including high- level waste, contaminated soil and groundwater,” Daniel Poneman, the U.S. Deputy Secretary at the Department of Energy, said in Tokyo yesterday. The Hanford Site in Washington State and the Savannah River Site in South Carolina have more than 90 million gallons of liquid waste in tanks the government is working to convert into more stable forms that do not threaten the environment, he said. Japan's government has requested support from the U.S. to decommission the Fukushima Dai-Ichi plant as well as managing the site from an environmental perspective, he said. TOKYO — Nine months after the devastating earthquake and tsunami knocked out cooling systems at the Fukushima Daiichi nuclear plant, causing a meltdown at three units, the Tokyo government is expected to declare soon that it has finally regained control of the plant’s overheating reactors. But even before it has been made, the announcement is facing serious doubts from experts. On Friday, a disaster-response task force headed by Prime Minister Yoshihiko Noda will vote on whether to announce that the plant’s three damaged reactors have been put into the equivalent of a “cold shutdown,” a technical term normally used to describe intact reactors with fuel cores that are in a safe and stable condition. Experts say that if it does announce a shutdown, as many expect, it will simply reflect the government’s effort to fulfill a pledge to restore the plant’s cooling system by year’s end and, according to some experts, not the true situation. If the task force declares a cold shutdown, the next step will be moving the spent fuel rods in nearby cooling pools to more secure storage, and eventually opening the reactors themselves. However, many experts fear that the government is declaring victory only to appease growing public anger over the accident, and that it may deflect attention from remaining threats to the reactors’ safety. One of those — a large aftershock to the magnitude 9 earthquake on March 11, which could knock out the jury-rigged new cooling system that the plant’s operator hastily built after the accident — is considered a strong possibility by many seismologists. They also said the term cold shutdown might give an exaggerated impression of stability to severely damaged reactors with fuel cores that have not only melted down, but melted through the inner containment vessels and bored into the floor of their concrete outer containment structures. Perhaps to give itself some wiggle room, the government is expected to use vague terminology, announcing that the three damaged reactors are in a “state of cold shutdown.” Experts say that in real terms, this will amount to a claim that the reactors’ temperatures can now be kept safely below the boiling point of water, and that their melted cores are no longer at risk of resuming the atomic chain reaction that could allow them to again heat up uncontrollably. And indeed, experts credit the operator, the Tokyo Electric Power Company, or Tepco, with making progress in regaining control of the damaged reactors. They say the plant’s makeshift new cooling system, built with the help of American, French and Japanese companies, has managed to cool the reactors’ cores, including the molten fuel attached to the outer containment vessels. Experts also say a new shedlike structure built over the heavily damaged Unit 1 reactor building has helped cap the plant’s radiation leaks into the atmosphere. The building was one of three reactor buildings destroyed in hydrogen explosions in March that scattered dangerous particles over a wide swath of northeastern Japan. Still, experts say the term is usually reserved for healthy reactors, to indicate that they are safe enough that their containment vessels can be opened up and their fuel rods taken out. But they warn it may take far longer than even the government’s projected three years to begin cleaning up the melted fuel in Fukushima Daiichi’s damaged reactors. This has led some experts to say that proclaiming a cold shutdown may actually be deceptive, suggesting the Fukushima plant is closer to getting cleaned up than it actually is. “Claiming a cold shutdown does not have much meaning for damaged reactors like those at Fukushima Daiichi,” said Noboru Nakao, a nuclear engineering consultant at International Access Corporation. In fact, experts point out, damaged fuel cores have yet to be removed from plants that suffered meltdowns decades ago. In the case of Chernobyl, Soviet officials simply entombed the damaged reactor in a concrete sarcophagus after the explosion there in 1986. Some experts said talk of a cold shutdown deflected attention from the more pressing problem of further releases of radioactive contamination into the environment. In particular, they said there was still a danger to the nearby Pacific Ocean from the 90,000 tons of contaminated water that sit in the basements of the shattered reactor buildings, or are stored in fields of silver tanks on the plant’s grounds. “At this point, I would be more worried about the contamination than what’s happening inside the reactors,” said Murray E. Jennex, an expert on nuclear containment at San Diego State University. Mr. Jennex said he believed the government’s claim that the reactors themselves were now stable, and particularly that the resumption of the heat-producing chain reaction called fission was no longer possible. While the discovery last month of the chemical xenon, a byproduct of fission, in one of Fukushima Daiichi’s reactors briefly raised alarms that a chain reaction had restarted, Mr. Jennex said enough of the radioactive fuel had decayed since the accident in March to make that unlikely. Other experts disagreed. Kyushu University’s Mr. Kudo said that the restart of fission, a phenomenon known as recriticality, could not be ruled out until the reactors could be opened, allowing for an examination of the melted fuel. But he and other experts said their biggest fear was that another earthquake or tsunami could knock out Tepco’s makeshift cooling system. They noted that it was not built to earthquake safety standards, and relied on water purifiers and other vulnerable equipment connected to the reactors by more than a mile and a half of rubber hoses. Nothing stirs in the empty heart of Tomioka, a community of 16,000 now reduced to the eerie status of a ghost town after the nuclear disaster at Fukushima. The shops of the main street are deserted, motorbikes and cars are abandoned, weeds push through gaps in the concrete. Vending machines selling drinks and snacks - always popular in Japan - stand unlit and silent. Tomioka lies just inside the 20km exclusion zone that was hurriedly enforced last March when a radioactive cloud escaped from the stricken power plant. In the rush to flee, doors were left wide open. Windows and roofs shattered by the earthquake and tsunami are still not repaired. A bicycle leans against a lamp-post. We are making the visit after reassurances from scientists and other journalists that radiation levels had fallen in this particular area. The worst of the contamination was blown northwest of Fukushima while Tomioka lies to the south. Nevertheless we equip ourselves with overalls, boots, gloves and face-masks, all designed to minimise contact with the dust that is likely to be the main source of radioactivity. The public and media are banned from entering the zone but as we approach a police checkpoint we are not stopped. We continually operate a Geiger counter - and though the radiation level rises slightly once we cross into the zone, it is even lower than we had expected. For the record, during the course of a three-hour visit - which we kept deliberately short to minimise the risks - the rate averages about three microsieverts per hour. We estimate our total dose to be roughly half that of a typical chest X-ray. Our guide is a local farmer, Naoto Matsumura, eager for the world to see how his community has suffered. Although he was part of the initial exodus after the accident, he could not bear life in a refugee centre and soon moved back to his farm, refusing orders to leave. He's the last citizen to remain but he believes that it's his duty to do whatever he can to keep Tomoika going as a community. "We want this place to be safe again," he tells me, as we drive through quiet streets and past overgrown paddy-fields. "We need gas, electricity and water. But the old people still want to come back, even my mother and father. Their wish is to die here. "Now it's just me taking care of the animals." The fate of the livestock is one immediate challenge. Dozens of cattle broke free after the evacuation and now roam wild. Pigs and farmed boar also escaped and are living a feral existence - I see one litter of very young animals who have only known life inside the nuclear zone. But others remained trapped - their owners fled in too much of a hurry to release them - and they have since starved to death. Mr Mastumura leads us to a large cattle farm. Beef from this area used to be highly prized for its taste and quality. Wrecked by the quake and over-run by massive spiders' webs, the sheds now make for a very grim scene. At one end of a row of pens, I see the decomposed bodies of a cow and her calf. In all, 60 cattle perished here. Mr Matsumura believes the authorities have failed the people of the area - which is why he's taken the risk of bringing us in. As we keep watch on the Geiger counter, the radiation level, as expected, is generally higher down on the ground, very occasionally peaking at around 30 microsieverts an hour. On a very rapid visit like ours, these rates are by no means threatening. But I ask our guide if he worries about living in this environment. "I refuse to think about it," he says, joking that his chain-smoking may be more dangerous. There may be others willing to join him but the exclusion order is unlikely to be lifted - even in this area - for a while yet. FUTABA, Japan — Futaba is a modern-day ghost town — not a boomtown gone bust, not even entirely a victim of the devastating earthquake and tsunami that leveled other parts of Japan’s northeast coast. Its traditional wooden homes have begun to sag and collapse since they were abandoned in March by residents fleeing the nuclear plant on the edge of town that began spiraling toward disaster. Roofs possibly damaged by the earth’s shaking have let rain seep in, starting the rot that is eating at the houses from the inside. Those who fled Futaba are among the nearly 90,000 people evacuated from a 12-mile zone around the Fukushima Daiichi plant and another area to the northwest contaminated when a plume from the plant scattered radioactive cesium and iodine. Now, Japan is drawing up plans for a cleanup that is both monumental and unprecedented, in the hopes that those displaced can go home. The debate over whether to repopulate the area, if trial cleanups prove effective, has become a proxy for a larger battle over the future of Japan. Supporters see rehabilitating the area as a chance to showcase the country’s formidable determination and superior technical skills — proof that Japan is still a great power. 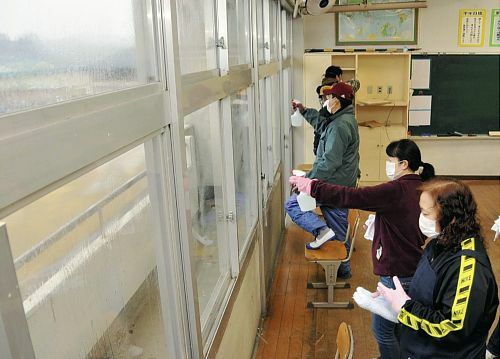 For them, the cleanup is a perfect metaphor for Japan’s rebirth. Critics counter that the effort to clean Fukushima Prefecture could end up as perhaps the biggest of Japan’s white-elephant public works projects — and yet another example of post-disaster Japan reverting to the wasteful ways that have crippled economic growth for two decades. So far, the government is following a pattern set since the nuclear accident, dismissing dangers, often prematurely, and laboring to minimize the scope of the catastrophe. Already, the trial cleanups have stalled: the government failed to anticipate communities’ reluctance to store tons of soil to be scraped from contaminated yards and fields. And a radiation specialist who tested the results of an extensive local cleanup in a nearby city found that exposure levels remained above international safety standards for long-term habitation. Even a vocal supporter of repatriation suggests that the government has not yet leveled with its people about the seriousness of their predicament. To judge the huge scale of what Japan is contemplating, consider that experts say residents can return home safely only after thousands of buildings are scrubbed of radioactive particles and much of the topsoil from an area the size of Connecticut is replaced. Even forested mountains will probably need to be decontaminated, which might necessitate clear-cutting and literally scraping them clean. The Soviet Union did not attempt such a cleanup after the Chernobyl accident of 1986, the only nuclear disaster larger than that at Fukushima Daiichi. The government instead relocated about 300,000 people, abandoning vast tracts of farmland. Many Japanese officials believe that they do not have that luxury; the area contaminated above an international safety standard for the general public covers more than an estimated 3 percent of the landmass of this densely populated nation. Such resolve reflects, in part, a deep attachment to home for rural Japanese like Mr. Watanabe, whose family has lived in Okuma for 19 generations. Their heartfelt appeals to go back have won wide sympathy across Japan, making it hard for people to oppose their wishes. But quiet resistance has begun to grow, both among those who were displaced and those who fear the country will need to sacrifice too much without guarantees that a multibillion-dollar cleanup will provide enough protection. Soothing pronouncements by local governments and academics about the eventual ability to live safely near the ruined plant can seem to be based on little more than hope. No one knows how much exposure to low doses of radiation causes a significant risk of premature death. That means Japanese living in contaminated areas are likely to become the subjects of future studies — the second time in seven decades that Japanese have become a test case for the effects of radiation exposure, after the bombings of Hiroshima and Nagasaki. The national government has declared itself responsible for cleaning up only the towns in the evacuation zone; local governments have already begun cleaning cities and towns outside that area. Inside the 12-mile ring, which includes Futaba, the Environmental Ministry has pledged to reduce radiation levels by half within two years — a relatively easy goal because short-lived isotopes will deteriorate. The bigger question is how long it will take to reach the ultimate goal of bringing levels down to about 1 millisievert per year, the annual limit for the general public from artificial sources of radiation that is recommended by the International Commission on Radiological Protection. That is a much more daunting task given that it will require removing cesium 137, an isotope that will remain radioactive for decades. Trial cleanups have been delayed for months by the search for a storage site for enough contaminated dirt to fill 33 domed football stadiums. Even evacuated communities have refused to accept it. And Tomoya Yamauchi, the radiation expert from Kobe University who performed tests in Fukushima City after extensive remediation efforts, found that radiation levels inside homes had dropped by only about 25 percent. That left parts of the city with levels of radiation four times higher than the recommended maximum exposure. “We can only conclude that these efforts have so far been a failure,” he said. Minamisoma, a small city whose center sits about 15 miles from the nuclear plant, is a good place to get a sense of the likely limitations of decontamination efforts. The city has cleaned dozens of schools, parks and sports facilities in hopes of enticing back the 30,000 of its 70,000 residents who have yet to return since the accident. On a recent morning, a small army of bulldozers and dump trucks were resurfacing a high school soccer field and baseball diamond with a layer of reddish brown dirt. Workers buried the old topsoil in a deep hole in a corner of the soccer field. The crew’s overseer, Masahiro Sakura, said readings at the field had dropped substantially, but he remains anxious because many parts of the city were not expected to be decontaminated for at least two years. These days, he lets his three young daughters outdoors only to go to school and play in a resurfaced park. “Is it realistic to live like this?” he asked. The challenges are sure to be more intense inside the 12-mile zone, where radiation levels in some places have reached nearly 510 millisieverts a year, 25 times above the cutoff for evacuation. Already, the proposed repatriation has opened rifts among those who have been displaced. The 11,500 displaced residents of Okuma — many of whom now live in rows of prefabricated homes 60 miles inland — are enduring just such a divide. The mayor, Mr. Watanabe, has directed the town to draw up its own plan to return to its original location within three to five years by building a new town on farmland in Okuma’s less contaminated western edge. Although Mr. Watanabe won a recent election, his challenger found significant support among residents with small children for his plan to relocate to a different part of Japan. Mitsue Ikeda, one supporter, said she would never go home, especially after a medical exam showed that her 8-year-old son, Yuma, had ingested cesium. She, like many other evacuees, berated the government, saying it was fixated on cleaning up to avoid paying compensation. Many older residents, by contrast, said they should be allowed to return. But even Mr. Kodama, the radiation expert who supports a government cleanup, said such a victory would be hollow, and short-lived if young people did not return. He suggested that the government start rebuilding communities by rebuilding trust eroded over months of official evasion. An earlier version of this article said the evacuation zone covered more than 3 percent of Japan’s landmass; in fact it is the area contaminated above an international safety standard for the general public that covers roughly 3 percent of the country’s landmass. Many Japanese officials believe that they do not have that luxury; the evacuation zone covers more than 3 percent of the landmass of this densely populated nation.